Every second Sunday in May is Mother's Day. While the great day for mother is approaching, what's your 2018 Mother's Day gift plan to express your sincere appreciation for everything more than just a simple "happy Mother's Day"? Flowers, shopping or dining out, as always, are good ideas, while spending time together with mom to watch Mother's Day movies seems much sweeter. All Mother's Day movies lists may seem to be a little subjective. And a good movie is not always a good Mother's Day film. So here we've cherry-picked top 5 movies for Mother's Day of all time and best mother movies of 2016-2018 for you to choose. As for which you will be watching on the special Sunday, it depends on your Mother'spreference. 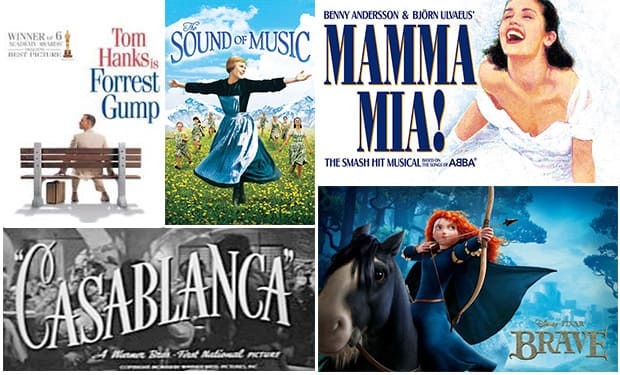 The top 5 best Mother's Day movies of all time listed below center on mother-related themes or mothers-favorite kinds. All of these mom films are classics. You may have seen some of them. Enjoy it again with your mother and together create a wonderful sweet night. Some of them are really old classics. Suppose you have Mother's Day movies DVDs, but are scratched or damaged, or you just want to backup them for next Mother's Day, you need a helpful DVD ripping tool to do it all. WinX DVD Ripper - free rip DVD movies to Hard Drive. Keep 100% original video/audio/subtitles within only 5 mins! Plot: Forrest Gump, while simple with a low I.Q., overcomes all obstacles in life. Rated as best Mother's Day film for: This charming and profound Paramount movie has touched millions of people, evident in the 6 Oscars and ultra-high ratings by movie lovers. And your mother will become one of them probably later. Tom Hanks, with his astounding performance and popularity for mom generation, makes it a perfect Mother's Day movie. Warm scenes of Forrest Gump and his mother Sally Field attribute a lot too. This is a best Mother's Day movie with best mother and child relationship. Plot: A young woman about to be married tries to find her real father without telling her mother. Rated as best Mother's Day movie for: This fantastic movie has the potential to make your mother and you laugh out loud for few hours in this special rest day. Nothing is more important than making your mother happy and relax in Mother's Day. And this Mother's Day film with beautiful scenery and wonderful songs should be the best option if you are trying to create a joyful holiday mood. Plot: An impetuous daughter of royalty in Scotland Merida determined to make her own path in life and defies a custom that brings chaos to her kingdom. Rated as best Mother's Day movie for: This is a fascinating treat for both mother and child by Walt Disney and Pixar on Mother's Day. Child will be addicted to the spectacular animation for its interesting characters while mothers may pay attention to the mother-daughter relationship in this mom film. Daughter wants to chase freedom, while mother just hopes her be married and settle down. People love it for its beautiful settings and heartfelt story line. Wish your mom will love it too. Plot: A woman leaves an Austrian convent to become a nanny to the children of a naval officer widower. Rated as best Mother's Day movie for: Add this one to your movies for Mother's Day to come and you won't be disappointed. People take this mother and child movie musical as their favorite movie of all time for some reasons, such as breathtaking scenery, memorable songs and its high scores. It is a timeless classic and a good one for Mother's Day . Such sweet Mother's Day film may be exactly what your mom need at the special moment being with you. Someone says "Mother's Day movie list will be incomplete without it". Mom says: I've loved this film for thirty years. Plot: An American expatriate meets a former lover in unoccupied Africa during the early days of World War II, with unforeseen complications. Rated as best Mother's Day movie for: The truth is that mothers still are and always will be great fans of love romantic films. And a classic like Warner Bros. Casablanca is worth remembering. Although this recommended Mother's Day film is made by white and black photography, the great story embedded in it for love and glory, courage and bravery, is appealing to both man and woman. This would be best one in Romance genre for your Mother's Day movie choice. ● Life of the Party (11 May 2018): Mother Deanna is suffering the middlelife crisis after her husband decided to break the marriage with her. Therefore, she makes her mind to get back to college for a degree. Although she is enrolled in her daughter's classes surprisingly, she finally starts her self-discovery journey. ● Snatched (2017): Misfortunes never come singly. Emily Middleton was dumped by her rock musician boyfriend while still losing her job. Therefore, she is planning a tour to Ecuador along with her mother Linda, who tells her to come home and pick herself up. ● Mother's Day (2016): Three generations come together in the week leading up to Mother's Day. Named excitedly the same as the festival, it is without any question the closest visual-audio content to watch in a maternal May. By the way, for the Mother's Day movie, Julia Roberts made the 4th collaboration with director Gary Marshall, after Pretty Woman, Runaway Bride and Valentine's Day. ● The Eyes of My Mother (2016): The movie is about a young, lonely woman who is consumed by her deepest and darkest desires after tragedy strikes her quiet country life. Serial murder has rarely seemed a more melancholy calling than it does in "The Eyes of My Mother," a short, decidedly unsweet and wholly startling vision from freshman writer-director Nicolas Pesce. ● Under the Shadow (2016): It is a different sort of Mother's day material, not a sweet one. It is, specifically, a horror or thriller film revolving in the terrors of the post-revolution, war torn Tehran of the 80s. But a mother and daughter together struggle against it, before a mysterious evil begins to haunt their home. Ripping DVD to digital formats not only allows you to watch DVD content on more devices, but also protect your DVDs for longer lifespan. Fully hardware-accelerated WinX DVD Ripper Platinum can rip mom film DVDs to iPhone X/8, Samsung Galaxy S/Note, HTC, Huawei, Sony PS/4 etc. DVD backup also features are copying DVD to DVD folder, ISO image or single MPEG 2 file. Easy steps: Insert DVD into the computer DVD-ROM drive -> Open WinX program and load DVD content -> Choose output video format or a specific device you wanna watch the mother movie on -> Run DVD ripping process in minutes by taking advantage of Intel QSV or Nvidia GPU hardware. Disclaimer: We only advocates ripping copying Mother's Day films DVDs for personal use and suggests referring to the DVD copyright laws in your countries before doing it. If it's hard for you to say "I Love You" directly to your dear mother, why not free download Mother's Day songs to show your deep love for her? It is time to show our love to our mothers! Right here, right now, let's honor our mothers with a meaningful Mother's Day gift. Calendar of latest/upcoming new movie DVD releases with release dates. Rip any newly-released protected DVD movie to MP4, AVI, MOV, H.264, etc.